In Womanthology: Heroic, Munny, a lone stuffed bunny, showed her inner hero and entered the frightening world of dolls to save her best friend, Elephant, with only a butter knife and a sugar bowl lid. But the dolls are not pleased to lose their new pet and ready to launch an expedition of their own to take him back. Now Munny has to return to Doll-Land and venture deep, deep into their dark world of strange beauty and unexpected horror, accompanied only by a valiant band of fellow stuffed animals. 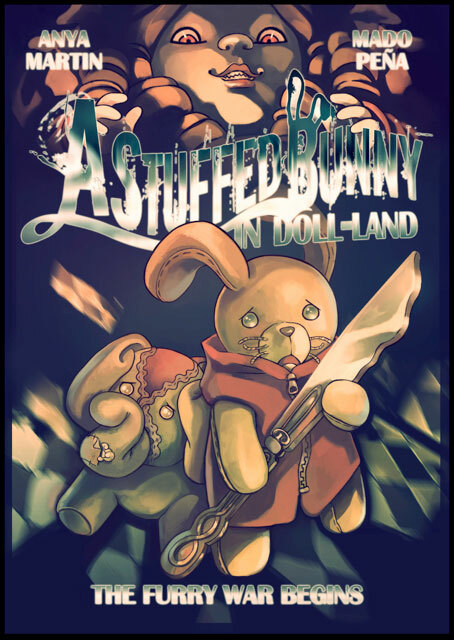 “A Stuffed Bunny in Doll-Land” comes from a rich tradition of quest stories involving toys come to life from Winnie the Pooh to Toy Story. The short graphic story has been receiving praise in multiple reviews as a must-read piece in Womanthology: Heroic, which caused an Internet sensation as the top-fundraising effort in comics in 2011 raising more than $109,000. “Mado Peña’s macabre illustrations and muted colors give way to a frenzied red as events reach their climax in Anya Martin’s wonderfully weird ‘Stuffed Bunny in Doll Land’ (so I was not the only girl who found dolls frightening! ),” writes Lynda E. Rucker for ComicBuzz.com. Read more review excerpts and listen to an interview with Anya on the press page here. Artist Mado Peña and writer Anya Martin are heading to San Diego to take Comic Con by storm. For their signing schedule, click on the appearances page. The Furry War begins anew right here soon.